Forum mall in Bangalore is not the best place to have any kind of serious dialogue and Café Coffee Day does not make things any quieter. However, it was the most convenient place for three of us, I, my friends Sanjeev Krishnan and Dr. G. N. Shrinivas (called Gun) from IIT Bombay to reconnect on the topic of technical career path and role of solution architect. Gun is currently an Enterprise Architect at a large MNC IT company. He has a Ph.D. from Oxford University in Mathematical Sciences. Views expressed here are his personal views. Sanjeev is the founder of Magic Lamp Software a technology firm providing products and services related to quality audit of Java based software. Before starting his own venture; Sanjeev was a Senior Staff Engineer (a technical ladder position) in Sun Microsystems specializing in J2EE platform. Sanjeev has a PhD in Computer Science from University of Illinois Urbana-Champaign. Vinay: Can you tell us what does a solution architect role involve? Gun: Solution architects (especially seen from a IT_Service_Provider_in_India_perspective) is a catalyst for successful service delivery. This role spans the entire lifecycle of a project, especially the initial phases of the project, (during pursuit and the requirements gathering phases). Requirements are only as perfect as the person who gathers them and documents them. The challenge is that there usually is a very large amount of contextual assumptions which are built into requirements when they are specified by the customer (users). Solution architects at that time play the role of voice of customer in clarifying these assumptions to the delivery team. It involves asking questions like: “Are you making right kind of tool choices?”, “Are you making right product choices?”, “Are some of the proposal assumptions too narrow?” etc. Another aspect of the role involves assisting sales proposal making / deal making etc. (also called pre-sales). A third aspect often seen in customer relationships in multi-year contracts, involves being an advisor to the customer. In this role, the Solution Architect helps the customer identify, understand and plan for external impetus to the technology landscape! E.g. new features from some of the upcoming releases of platforms which might be of interest to the client (like Oracle). While doing all the above, the Solution Architect is often called upon to help build competency within the organization through various initiatives like knowledge sharing, technology conference and certifications. Vinay: Can you tell us about your ITAC certification experience? Gun: ITAC stands for IT Architecture Certification. It is managed by The Open Group and it has three levels of certifications (level-1, 2 and 3). Level-1 is a junior architect who can contribute into an architecture team (i.e. needs to be managed). Level-2 is called a Master Architect and he/she can take independent responsibility of delivery of a system or solution. 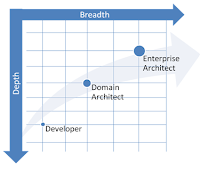 At Level-3, one should have demonstrated significant breadth and depth of impact on business or the architecture community by applying IT architecture. From a process standpoint, I had to fill in a form from The Open Group, and by the time I was finished, it was a 50 page document. The form requires you to document (exhaustively) how you have performed various architectural activities, and wants you to demonstrate that this has been a consistent feature in your career (not a flash in the pan). This submission was reviewed by an independent committee by way of a board review / interview. I can see two kinds of benefits from this certification. One, it held a mirror to me to see whether I was doing the right things in my career from an Architecture standpoint. The second side of to benefits from certifications (as yet unproven) is whether certified architects can charge a premium for architectural consulting skills. The article was quite informative. I am looking at an IT architect from a customer point of view. True, in large and customized projects, the role of the IT Architect (or maybe a team) plays an important role. It's almost as if they are the key to the project's success or "forced success". This assumes greater importance in the Govt sector in our country as they are amongst the largest consumer of automation / IT technology in various fields, be it revenue, I Tax, population mapping, crop prediction, only to name a few. These projects are also on in a big way with the armed forces with the weapon systems of today getting more sophisticated, software intensive and complex to understand and use for the soldier.